Two of the vampires who inhabit the world of the Camarilla in the game Vampire: The Masquerade. Vampire: The Masquerade is a popular role-playing game introduced in 1991 by creator Mark Rein-Hagen of White Wolf Game Studio. It quickly challenged the popularity of Dungeons and Dragons, the original role-playing game, and itself became the basis of several other horror role-playing games based on the Werewolf and Wraith, and a role-playing card game, Vampire: The Eternal Struggle (originally named Jyhad). From the beginning, the game presented a complete alternate worldview, the fantasy into which the player enters, a world in which vampires and other creatures of horror such as ghouls and werewolves populate the landscape. The popularity of the game, however, has allowed for its expansion and the development of different aspects of the fantasy world in great detail. Role-playing games are built around a storyteller, who begins a story in which all of the players are characters. As the story unfolds, the players become active participants and their actions have consequences for winning and losing. Players of Vampire: The Masquerade enter the fantasy world by creating a character (numerous suggestions are given in the literature published to support the game), a vampire, or possibly a werewolf or ghoul minion, and during the game they assume and act as that character along with all of the other characters who inhabit the local vampire community. In the world of this role-playing game, there is a community of vampires who exist incognito within the space otherwise inhabited by humans. Since they closely resemble humans, and thus have little problem passing as such, they can come out at night and co-mingle, especially when they are in search of food. However, mostly they move among themselves. There is an organized vampire society whose power is held by older vampires, the majority of whom have withdrawn into their solitude. The more visible society is highly politicized and power is the valued commodity. Thus, most stories concern the jockeying for power among the players. Vampire: The Masquerade began as the table game Vampire, in which a small group of players gathered to listen to a storyteller and periodically stopped action to interact, the consequences of the player’s acts being determined by the throw of the dice. Players had a supply of blood and when their acts led to a complete loss of blood, they lost. However, the game continued to evolve, and in 1993 Rein-Hagen introduced the live-action version of the game, The Masquerade. This version freed the game from the delays caused by the use of dice, which were replaced with a series of hand signals. The new form of the game, termed LARP or live action role playing, allowed players to remain in character during virtually all of the game and vastly expands the number who can play at one time. 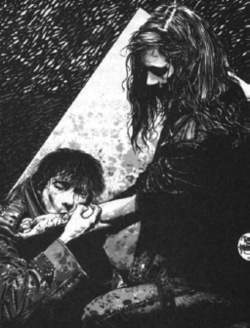 As currently played as Vampire: The Masquerade, as many as 20 or more players can for several hours each enter a new persona and act out a situation presented to him or her or carried over from the last session. A local playing group will usually gather to play at midnight on a predetermined day, once or twice a month. At present, the typical game is set in the local community and the players assume a position in the local vampire society. There is a prince, the nominal head of the community, and the vampires identify with one of the several clans, each clan having its own particular characteristics and local leaders. Overall, the members of the community must keep up the Masquerade, that is, perpetuate the idea among humans that vampires are a thing of the past, a myth best sold as the scientific conclusion that vampires never really existed. Breeching the rules of secrecy brings the wrath of the community down upon a vampire. It is also the assumption of the game that the Masquerade is currently threatened by the current youth culture. Mind-altering drugs, rock music, and the popularity of the vampire image in Western culture have opened large segments of the public to the possibility that the vampire exists and many people even view vampiric existence as a desirable life they would assume if only it were possible. A second threat is posed by the new generation gap between the older vampires who originally conceived the Masquerade and have enforced its existence, and a brash younger generation of new vampires who are seen as acting in such a way as to call human attention to vampire society. As a sophisticated role-playing game, Vampire: The Masquerade assumes the following vampire myth: Succinctly stated, vampire society originated with Caine (the cursed brother introduced in the Bible in the fourth chapter of Genesis). According to the game, the curse was that he was made a vampire. After wandering in the wilderness for many years, he settled down and created a city. He also created other vampires, the second generation, who in turn created a third generation. They built a city. The city was destroyed by a flood, and the survivors of the third generation scattered around the world. Whether Cain or any of the second generation survived is unknown. Various individuals of the third generation would become the originating vampire of the bloodlines that would later become the clans. The vampires of the fourth and fifth generation have largely withdrawn from any involvement with the larger vampire community. The bulk of the presently existing vampires constitute the sixth generation, and they face pressure to create no more vampires as it is believed that the blood thins (the vampiric powers diminish) as each generation from Cain is created. The vampire clans originated from the banding together of the children (new generations) of the third generation who found in their physical relationship shared characteristics of the one who originated the bloodline. Enlightened self-interest became a reason to organize more or less loosely, and create a clan ethos. There are seven major clans: the Brujah, the youthful rebels; the Gangrel, the wanderers; the Malkavian, somewhat insane; the rodent-like Nosferatu; the Toreador, often described as hedonists; the Tremere, the best organized of the vampires; and the Ventrue the most human of the vampires. There are also other clans who are not members of the Camarilla such as the Assamite and the Giovanni. And finally there are the Caitiff, or clanless vampires. The latter are usually the result of having been abandoned by those who made them vampires. The clans are at the heart of the political intrigues of the vampire community. In the middle of the fifteenth century, the Inquisition wreaked havoc on “the Kindred” and whole bloodlines were stamped out (put to the true death in fire). At about the same time, some of the youthful vampires, who were being used as a barrier between the elders and the Inquisition, rose in revolt. The revolt of the Anarchs spread. This period of attack drove the survivors completely underground. In 1486 at a global convocation, a secret worldwide network, the Camarilla, was established. It established a rule of law for the community of vampires. Within the community are some powerful individual vampires called justicars who have been granted the power to punish lawbreakers. Vampires are largely urban dwellers, and currently each major city supports a vampire community. It is headed by a prince, and any vampire changing locations is expected to present him-or herself to the prince of their new city (or alternate authority where no prince has been designated, as in Los Angeles). According the game’s myth, the elder vampires have more powers than newer ones. For both old and young, the stake is hurtful, producing a form of paralysis, but by itself not fatal. Sunlight and fire are the main dangers. Holy objects have no effect, nor does running water. The vampire has sharpened senses that aid them in hunting, including the power to impose their will on mortals. The elder vampires can change shapes, but most of the newer ones cannot. New vampires can be created by first having their blood drained and then receiving some of the vampire’s blood, although the new vampire has slightly less power than that of the vampire who created him or her. Vampires no longer breathe, although they can fake respiration. The heart no longer beats, the blood consumed spreads through the body by osmosis rather than through the old artery/vein system. It carries the necessary oxygen. The vampire heals quickly of most wounds. Vampire: The Masquerade has continued to evolve. In 2004, it was basically superseded by a new version of the game, Vampire: the Requiem, which kept the basic myth and playing structure, but offers a variety of modifications, such as revamping the clan structure. It emphasized five clans—the Daeva, The Gangrel, The Mekhet, Nosferatu, and the Ventrue—as well as a set of new non-clan groups. All add new story lines and variety to the play. Vampire: the Requiem was immediately incorporated into World of Darkness, by which the various fictional story lines of the several White Wolf horror-based games are related. A new World of Darkness text was issued simultaneously with the initial Vampire: the Requiem text in 2004. Vampire: the Requiem was also an integral part of the Mind’s Eye Theatre, the name given to the live action role-playing (or LARP) version of White Wolf’s various games. Unwittingly, Vampire: the Masquerade became the environment for the emergence of the new real vampire community. In the 1990s, hundreds of people who self-identified as real vampires (among the thousands who simply played the game) found their way to the Camarilla, the game’s fan club and emerged as leaders. Possibly the most notable, Michelle Belanger in Ohio and Father Sebastiaan in New York City were active for several years in the gaming world, which provided a context to meet other real vampires and out of which some of the early real vampire organizations emerged in the mid-1990s. In 1996, Rod Ferrell, who had played the game in Kentucky, came to see himself as a real vampire and put together a small group of people who more-or-less believed him. The group was responsible for the murder of the parents of Ferrell’s girlfriend in Florida. They became the subject of a highly publicized trial that became a watershed moment for both White Wolf and the emerging real vampire community. White Wolf moved to distance itself from any real vampire-like contact and emphasized its entertainment focus. The new rules enforced in the wake of the Ferrell case worked for the new community of self-identified vampires who discovered that they no longer needed the LARP world. Enough real vampires had surfaced that they could operate on their own quite apart from the vampire gaming world (or other vampire interest groups). Meanwhile, as the World of Darkness has expanded, a vast literature has emerged to support the game. There are literally hundreds of books with suggestive new plots for the game’s storytellers, and a host of novels derived from White Wolf’s vampire universe. White Wolf maintains an expansive website at http://www.white-wolf.com/vam-pire/index.php. Many players are also members of the fan club created to carry the myth, appropriately named the Camarilla. It has also transformed over the years, and suffered greatly during the middle of the first decade of the new century when for a period White Wolf viewed it primarily as a tool for marketing new product. Ackels, Ron. The Kindred Most Wanted. Stone Mountain, GA: White Wolf Game Studio, 1995. 142 pp. Berry, Jeff. Alien Hunger. Stone Mountain, GA: White Wolf Game Studio. 64 pp. Brown, Steve. The Sabbat. Stone Mountain, GA: White Wolf Game Studio, 1993. 135 pp. Campbell, Brian, ed. Darkness Unveiled. n.p. : Wizards of the Coast, 1995. 200 pp. deLaurent, Aristotle. The Book of Nod. Stone Mountain, GA: White Wolf Game Studio, 1993. 134 pp. Findley, Nigel. Awakening/Diablerie: Mexico. Stone Mountain, GA: White Wolf Game Studio. 55 pp. Greenberg, Andrew, et al. Storyteller’s Handbook: The Complete Handbook for Storytellers of Vampire. Stone Mountain, GA: White Wolf Game Studio, 1992. 151 pp. Greenberg, Daniel. Who’s Who among Vampires: Children of the Inquisition. Stone Mountain, GA: White Wolf Game Studio, 1992. 70 pp. Koke, Jeff. Gurps Vampire: The Masquerade. Steve Jackson Games, 1993. 192 pp. McCubbin, Chris W. Vampire: The Masquerade Companion. Steve Jackson Games, 1994. 160 pp. Marmell, Ari, Dean Shomshak, and C.A. Suleiman. Vampire: The Requiem. Stone Mountain, GA: White Wolf Publishing, 2004. 294 pp. Rein-Hagen, Mark, et al. Book of the Damned. Stone Mountain, GA: White Wolf Game Studio, 1993. 138 pp. ———. Vampire: The Masquerade. Stone Mountain, GA: White Wolf Game Studio, 1991. 263 pp. Vampire: The Dark Ages. Clarkston, GA: White Wolf Game Studio, 1996. 286 pp. Wieck, Stewart. Ashes to Ashes: A Story for Vampire. Anniston, AL: White Wolf Game Studio, 1991. 80 pp. Wright, Jana. The Tome of the Kindred. Seattle, WA: The Camarilla, 1993. 44 pp. Nintendo of America Runner Up: Ape Escape (PS) - Sony Computer Entertainment America Best Flight Sim: Jane's USAF (PC) - Jane's Simulations No Runner Up Best Fighting: Soul Caliber (DC) - Namco Runner Up: Power Stone (DC) - Capcom Best RPG: Vampire: The Masquerade, Redemption (PC) - Nihilistic/Activision Runner Up: Deus Ex (PC) - Ion Storm/Eidos Best New Periph/Hardware PC: Riva TNT2 - NVIDIA Runner Up: 3Dfx Voodoo 3500TV - 3dfx Best New Peripheral/Hardware Console: The Dreamcast - Sega of America Runner Up: Neo Geo Pocket Color - SNK Corp. The All Games Network Best of E3 Award Winners Category Title/Publisher/Manufacturer Best Role Playing Game Vampire: The Masquerade REDEMPTION by Activision/Nihilistic Best Driving Game Need For Speed: High Stakes by Electronic Arts Best Hardware IntelliMouse Explorer by Microsoft Best Strategy Game Battlezone 2 by Activision/Pandemic Best Adventure Game Indiana Jones and the Infernal Machine by Lucas Arts Best Sports Game NHL 2000 by EA Sports Most Unique Product Redbeard's Pirate Quest, Ellie Enchanted Garden by Zowie Entertainment, Inc. The Sims (PC), Maxis Best Game, PC Black & White (PC), Lionhead Studios/Electronic Arts Freelancer (PC), Digital Anvil/Microsoft Giants: Citizen Kabuto (PC); Planet Moon Studios/Interplay Productions Soldier of Fortune (PC), Raven Software/Activision Team Fortress 2 (PC), Valve/Sierra Studios Vampire: The Masquerade, Redemption (PC), Nihilistic Software/Activision Best Game, Console Dino Crisis (PS), Capcom Entertainment Donkey Kong 64 (N64), Rare Ltd. He has written for many major roleplaying games, including Dungeons & Dragons, Advanced Dungeons & Dragons, and Vampire: the Masquerade. for the exclusive worldwide rights to publish Vampire: The Masquerade on CD-ROM. Vampire has grown into a storytelling sensation with a devoted global following," said Mark Rein Hagen, creative director and co-owner of White Wolf and author of Vampire: The Masquerade.